In recognition of Soapy Joe’s car wash conservation efforts, San Diego Major Kevin L. Faulconer officially proclaimed April 21, 2016, as Soapy Joe’s Car Wash Day. San Diego, Calif., - In recognition of Soapy Joe’s conservation efforts, San Diego Major Kevin L. Faulconer officially proclaimed April 21, 2016, as Soapy Joe’s Car Wash Day. The proclamation will be celebrated in connection with Earth Day, annually observed the next day. The proclamation honors Soapy Joe’s for its commitment to environmentally friendly operations. “Sustainability has always been a top priority for us,” says Lorens Attisha, CEO of Soapy Joe’s Car Wash. The San Diego car wash company focuses its efforts on one of the area’s most important natural resource – water. Using recycling, filtration and innovative technology, Soapy Joe’s strives to conserve water on a daily basis. Soapy Joe’s cleaning products are biodegradable and pH balanced to a neutral state during the washing process. The dirt and grime rinsed from cars is processed by facilities that convert it to beneficial materials, such as potting soil or fertilizer. 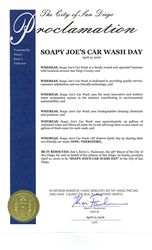 To celebrate the mayoral honor, Soapy Joe’s will give free top-of-the-line car washes at all eight locations that day via an online coupon available at SoapyJoesCarWash.com. Learn more about Soapy Joe's eco-friendly and water reclamation efforts. Soapy Joe’s is a family owned and operated car wash business with eight locations throughout San Diego County. The business offers express car wash services and oil changes, and is committed to protecting the environment with its water reclamation system and biodegradable cleaning products. Besides a commitment to the environment, Soapy Joe's is involved in various community efforts throughout San Diego County. More details about products and services can be found on the Soapy Joe’s Car Wash website.